Tydlig maltrostad ton med inslag av kaffe och rostade mandlar. Utpräglad karaktär av mörkrostad malt med inslag av choklad samt en lång efterbeska. UPDATED: MAR 21, 2019 Dark brown/black color, small brown head. Aromas of roasted malt, chocolate, hops and licorice. Taste of roasted malt, tobacco, licorice and hops. UPDATED: DEC 29, 2018 @ Bjällerödsvägen 29/12-18. Bottle from Systembolaget. Roasted malty with coffee, chocolate and notes of licorice. Body is medium, roasted finish. UPDATED: DEC 16, 2018 0,33l bottle. Pours black with light beige head. Vague aroma of coffee and roast. Taste is coffee, roast, dark chocolate, bitterness from the roast. Not a lot going on, it's fine. UPDATED: NOV 13, 2018 [email protected] meat, Stockholm. Opaque black color with tanned head. Aroma has caramel, licorice and chocolate. Taste is malty sweet with quite long a bit sweet aftertaste. Flavors of caramel, dark malt, licorice and dark fruits. Flaska 330 ml från Systembolaget. Svart med vitt skum. Doft av lakrits och malt. Maltig, smak av lakrits och kaffe. Mer intensiv i smaken jämfört med tex Guinness. Helt ok, bäst är den nog på fat om det nu finns. UPDATED: NOV 3, 2018 0,3 litre Bottle from Systembolaget Charlottenberg. Almost Black with offwhite head. Roasted malts, liqorice, coffee. 330 ml bottle at Hotel scandic nr 25, Göteborg. Black with off white head. Roasted malt with coffee and chocolate. Light bodied dry with low bitterness and soft carbonation. 330ml brown bottle poured into a tulip glass. Appearance is brownish black with a small tan head. Aroma of roasted malts, syrup loaf and a hint of raisins and dried prunes. Taste is medium sweet and light-medium bitter. Palate is light-medium bodied, soft texture and average carbonation. 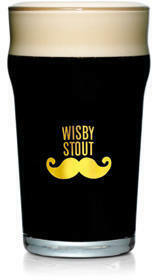 Wisby Stout is a decent beer for the style. A black beer, a head is medium and light beige. Aroma is balanced, roastiness of coffee and sweetness of chocolate. Taste has roastiness, coffee, some chocolate. Quite dry end even with some ash. Almost medium bodied. Good beer.